If there’s a better way to celebrate Independence Day than by finally granting yourself independence from pesky headphone cords, we don’t know what it is. Apple’s online store is still quoting shipping times of more than a week for new AirPods orders, which is beyond ridiculous at this point. 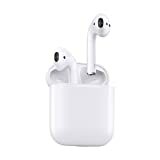 Meanwhile, Amazon has Apple MMEF2AM/A AirPods Wireless Bluetooth Headphones in stock with free Prime shipping. What are you waiting for! ?